The Science Channel has launched a science show series explaining some mind-boggling physics, including one segment which will feature an interesting expert: Bubbleologist Casey Carle. This new series of programs falls under the heading of “Sci Fi Science: Physics of The Impossible” and are based on Dr. Michio Kaku's NY Times best-seller "Physics of the Impossible," which examines the technologies of teleportation, star ships, antimatter engines, time travel and more. 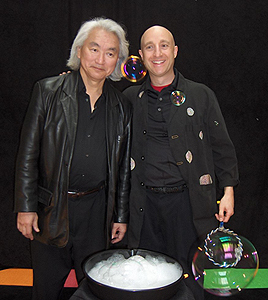 Dr. Kaku - who has a gift for using everyday science to explain complicated physics concepts - uses soap bubbles as metaphors to describe how physicists envision the origins, structure and continuing development of the universe and “parallel universes”. Which is how Carle came to be in the picture. 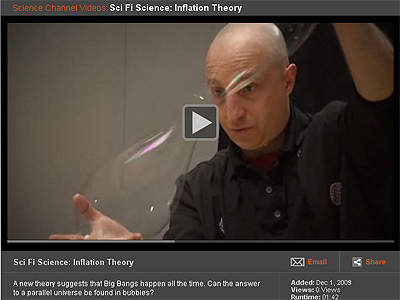 Dr. Kaku asked producers of the show to find a bubble expert to demonstrate manipulations that support these theories. The producers found world-renowned, award-winning bubbleologist Casey Carle who gladly agreed to participate. Filming of the segment took place at the Massachusettes Institute of Technology in Cambridge. Carle was filmed educating and engaging M.I.T. students in a lesson on “bubble-ology”. 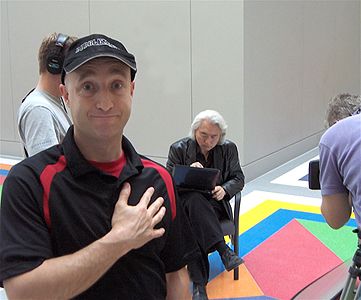 Dr. Kaku looked on as if "stumbling across this event and realizing its applications to [his] lecture." After the show, Dr. Kaku suggested specific bubble manipulations to Carle that coincide with the TV series' segment on space theory. Carle went to work with the segment's director and in addition to the requested bubble tricks, created one-of-a-kind images for the camera never before seen on stage or on television. In the presence of what Carle terms "the next genius to become a household name," the bubble master said he was nervous as well as grateful to be in Dr. Kaku's presence. "I was, of course, honored to be invited to take part and, yes, a bit nervous, too. But [Dr. Kaku] has a kind and approachable big brain. He graciously allowed me to ask multiple questions on various bubble- related science issues ranging from a soap film's prism effect to bubble fusion technology to a new type of computer storage called bubble memory," Carle said. "I tried to take advantage of a subject I actually know a bit about: Bubbles. It was fascinating and inspirational to say the least." The multi-part series was first broadcast in December 2009. Launched in 1999 and originally named Discovery Science, Science Channel features science-related programs covering all aspects of scientific study ranging from space and technology to prehistory and animals.